I’m reading The Organized Mind: Thinking Straight in the Age of Information Overload, by Daniel J. Levitin, at the moment. I’m early on in the book, but it’s already been very good. If you enjoyed Getting Things Done and other things of that nature, you’ll enjoy this one. It looks at how the mind works and why approaches like GTD work. I wanted to share a couple of excerpts I’ve found interesting so far. This one was good, because it talks through some more recent findings about how the brain works. The book mentions that we often have this idea in our heads that certain thoughts happen in different areas of the brain. It turns out a lot of thoughts actually happen amongst different networks within the brain. I’ll need to keep reading to really understand this, but this paragraph about consciousness struck me as being helpful. To recap, there are four components in the human attentional system: the mind-wandering mode, the central executive mode, the attentional filter, and the attentional switch, which directs neural and metabolic resources among the mind-wandering, stay-on-task, or vigilance modes. This one appealed to my more logical side. There seems to be four main components to how your brain manages what you’re paying attention to. Included in these four things, is actually the mind-wandering mode, which is that state that occurs when you’re not working directly on a task. Whilst we’re often derisive about this mode, it’s actually crucially important. We can’t possibly focus all the time and so the mind-wandering state is very important for recovering energy and maintaining a broad awareness. Ping me on cotap.me/stevehopkins if you wanna chat more about this post. Last night I turned off comments on this blog. This post you’re reading now shouldn’t have the option to comment on it at the footer of the post. Years ago I read a book called Naked Conversations, by Shel Israel and Robert Scoble that was really the first thing that inspired me to consider blogging in the first place. It was reading that book that inspired me to ping Ross and ask for his help to set this blog up originally and it was out of those conversations that I came to begin using Twitter. Indeed, I owe a lot to those years! I love small-s social, to coin a new (?) term. In it’s most pure form, it’s what happens when people contribute their thoughts on a great variety of topics into the public discourse. It makes us all smarter. Whether it’s messaging, Social Media (big S, lol), or something else this desire to speak into the commons is something that will not go away. Arguably, it’s been with us for all time. The more responsive we are to it, the better things tend to get. And so, I turned off comments. As things progressively move to being more mobile and more product and/or platform based, the old comment system familiar to blogs has become less relevant to me. Open conversation now happens on Twitter, mostly. My posts have never really generated a large swath of comments, anyway. My writing has never seemed to spark it like other bloggers have done. Most of my conversation today now happens in Yammer, Facebook Messenger (which is how I communicate with close friends) and Twitter. The conversation seems to have mostly moved on. It remains on some blogs; AVC is still one of my favourite blogs and it has a huge community following it. Even so, there’s still something romantic and unique to me about writing in long-form and I that’s what I’m enjoying about reading and writing more at the moment. I’m really enjoying being a subscriber (do sign up!) to Ben Thompson’s Stratechery, mostly because he writes terrifically well about a topic I’m passionate about. But he also generates a lot of discussion on Twitter to colour in the grey areas of the posts he writes, which is excellent to follow along with. So, what will happens to the conversations that take place around blogs? Could we see a return to conversations on blogs in a different and even more traditional sense? Here’s what I think is shaping up. For many reasons, we’re seeing more and more places pop up where the product and/or platform you’re using not only offers you features that help you write the blog, but also help you distribute it. Medium and Tumblr are the archetype here. 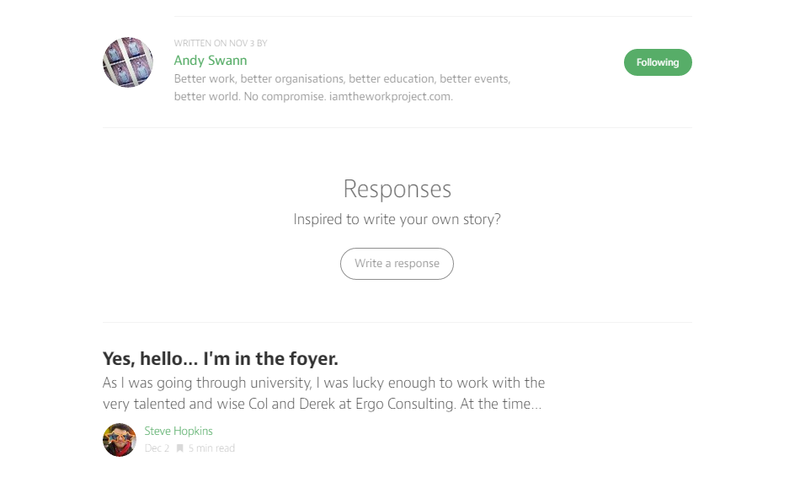 Medium has a beautiful feature that seems newer than most that allows you to respond to a post with your own post. I did this a couple of weeks ago when I wrote this response to Andy Swann and found it a great experience. I’m really enjoying using WordPress.com at the moment because I can feel that it’s maintaining the a place for me to build up a life’s work, similar to how Fred Wilson describes it here. But I can also feel that it is getting better and better to use for following and responding to others with long-form writing. So much so, I think it will stay ahead of places like Medium in the long run. So. No more comments but not necessarily no more conversation. If you’d like to chat about anything I’ve ever written here, I’d love to keep the conversation going either in your own blog post (by simply linking back to a post), reblogging my posts on WordPress.com or mentioning me on Twitter. I look forward to chatting with you sometime soon! A little while ago, Adam Nash – the CEO of Wealthfront – posted a great tweetstorm on why hiring new people was so important for companies. I remember seeing it and retweeting a number of the posts. Today, he posted a simple blog post outlining much of what he said on Twitter, but with more context. It’s a great read. Every new employee bets on the company, and the company bets on them. It’s one of the most human and yet often overlooked aspects of technology careers at startup companies. It reminded me to post quickly about a book I recently finished. The book is called The Alliance and is written by Reid Hoffman. Given Nash came from LinkedIn prior to Wealthfront, it’s no surprise that there’s a strong feeling that the post and book are cut from the same cloth. There’s two quotes I want to share that have stayed with me since reading it. Remember the underpinnings of the alliance: the company helps the employee transform his career; the employee helps the company transform itself and become more adaptable. Essentially, in the book Hoffman outlines three different buckets that both companies and employees can use to categorize how they’re growing their career at any given time by completing one of three types of Tour Of Duty: Rotational, Transformational, Foundational. This makes a lot of sense to me. This Slideshare is a great primer for the book so check it out in more detail. As Nash points out, every employee is taking a bet on the company when they join and vice versa. Being honest about that and being cognisant of how much each party is actually risking by working together allows the approach espoused by The Alliance to work. As the average time that someone spends working at one company continues to diminish, we can no longer risk being unclear about what we’re looking to get from our employees as employers. We must provide more clarity about the important work that needs to be done in our organisation and how our people can help carry that out. In the same vein, as an employee, it’s on us to bring this mindset into our careers and current jobs to express what growth we’re looking to achieve, and have a conversation about how we can do that together. Which brings me to the final quote I wanted to share from The Alliance. Never before in human history have so many people been connected by so many networks. Being a member of the ‘Yam-Fam’ I can relate to this one. Networks exist everywhere now. We’re becoming more and more connected, everyday – be it to the people we work next to, to our less immediate colleagues, to our vendors/partners/suppliers, to our customers and finally to the citizens of the world. Connecting with various communities in a relevant way that adds value to all parties is now, I believe, a core skill of any knowledge worker. There’s subtlety to this point. To me, this does not mean that it’s healthy to jump from job to job because opportunities continue to abound. For me, this means that the time you spend in one place should be determined by how well you feel you’re able to add value to that community. If you’ve only been around a short while, then the value you’ve provided to that community is probably low. However, if you do find a group of people that resonates with you in the present moment that allows you to grow your own skills and consciousness, along with the continued growth of the company, then you’ll have those connections for life. People like to work with great people. And people move on to new opportunities all of the time. If you’ve been a part of a high-performance team then it’s likely that you’ll get to join those folks again at some point in your career, when the stars align again. Anyways, the book is great as is Adam’s post. I hope you enjoy reading them. In the meantime, we’re hiring here at Yammer in a number of roles in our Engineering and Product organisation. If you want to work in a high-performance team that’s truly looking to help organizations become more responsive to their staff, partners and customers then please do get in touch on Twitter or email me.